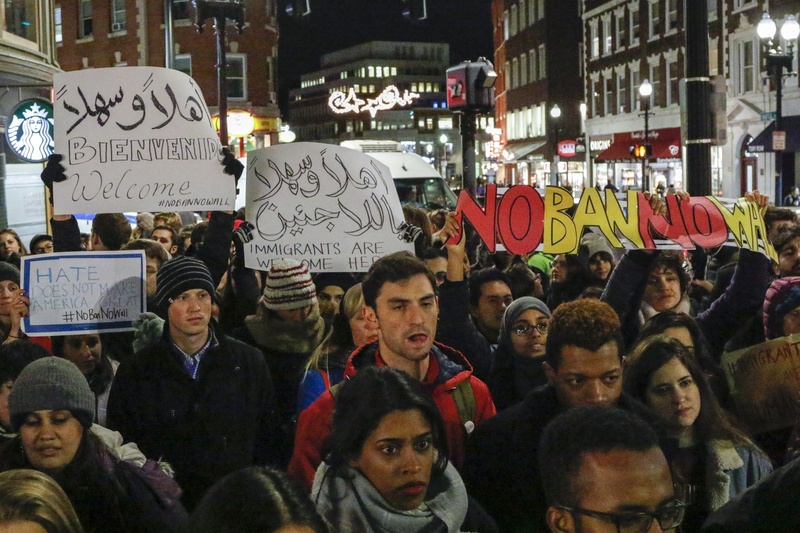 Demonstrators hold signs opposing President Donald Trump's immigration policies at a 2017 rally in Harvard Square. Cambridge Mayor Marc C. McGovern and Somerville Mayor Joseph A. Curtatone announced the cities’ creation of the United Legal Defense Fund for Immigrants in a joint press release Monday. The initiative is a partnership between the two cities and the Cambridge Community Foundation aimed at raising and distributing funds to cover legal costs for immigrants. Funds, in the form of grants, will be distributed to local non-profit organizations. The fund is intended to benefit immigrants who live and work in the Cambridge and Somerville areas — specifically Deferred Action for Childhood Arrivals recipients, Temporary Protected Status holders, unaccompanied minors, victims of trafficking or domestic violence, and “those seeking asylum from violence and persecution,” according to the press release. DACA is an Obama-era policy that allows undocumented immigrants brought to the United States as children to legally remain and work in the country; TPS allows individuals fleeing violence and natural disasters in their home country to live and work legally in the United States. This step is the latest the city of Cambridge — which maintains a sanctuary city status — has taken to protect its immigrant population in opposition to Trump administration policies. In March 2018, McGovern launched a similar program, the Cambridge Legal Defense Fund for Immigrants. That fund aimed to raise $500,000 and ultimately distributed $255,000; the new fund will continue with the original fundraising goal. “The creation of the United Legal Defense Fund for Immigrants marks a critical expansion and evolution of the McGovern-initiated Cambridge Legal Defense Fund for Immigrants,” the press release reads. McGovern said in an interview with The Crimson Monday that since immigration hearings are civil cases, many immigrants go without the protection of a lawyer. Curtatone said in the press release that access to legal services is tied to positive outcomes in the immigration court system. He said that the newly created fund will provide a “much better chance” for immigrants. “Our cities may not be able to change the immigration landscape nationally just yet, but the generosity of our residents and businesses can change immigration case outcomes locally,” he said. Though there is no definitive data on the number of “unauthorized immigrants” living in Cambridge and Somerville, the press release included statistics that indicate approximately 27 percent of Cambridge’s population is immigrants. In Somerville, immigrants comprise 25 percent of the population. Geeta K. Pradhan, president of the Cambridge Community Foundation, said in the press release that the United Legal Defense Fund for Immigrants is part of “an incredible grassroots effort” illustrating the increasing need for legal support for immigrants. “By unifying efforts to raise funds for the most vulnerable families in our community, we can help valued neighbors and stabilize families impacted by the stress and uncertainty of ongoing shifts in TPS and DACA status, and those seeking asylum,” she said. McGovern said he envisions a continued expansion of the Legal Defense Fund over time. In the future, he said he hopes to rally more cities and towns to the cause.